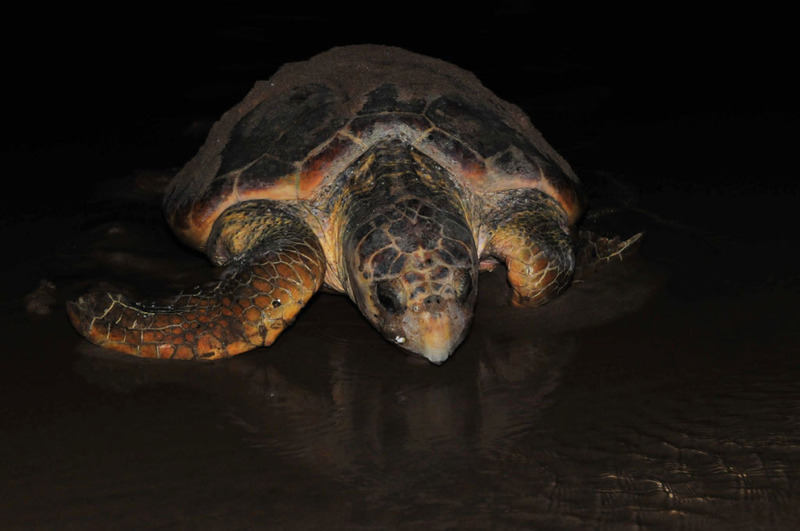 The sandy beaches of Cape Hillsborough National Park are one of the areas in the Mackay region where marine turtles come ashore and look for a suitable site to lay their precious eggs. Flatback Turtles are the most prominent in the region, but occasionally Green and Loggerhead Turtles make their way up the beaches. 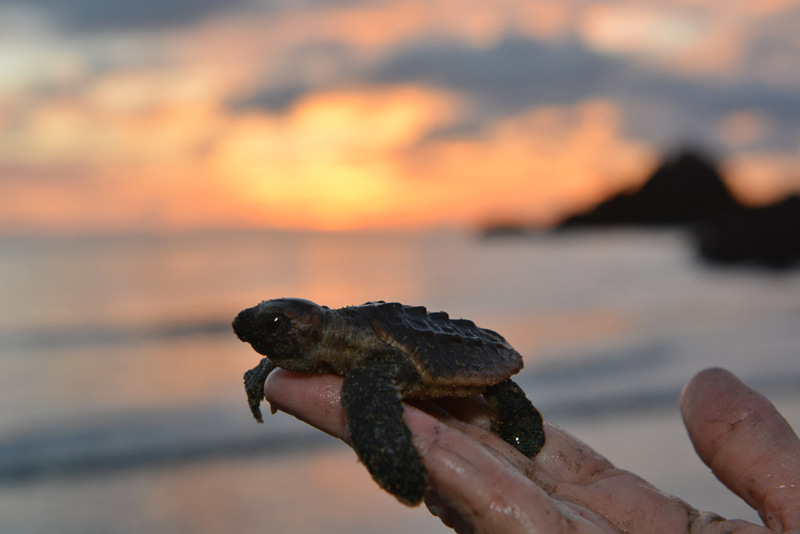 Nowhere near as big as the Loggerhead rookery at Mon Repos near Bundaberg, the area is no less important for these vulnerable turtles. 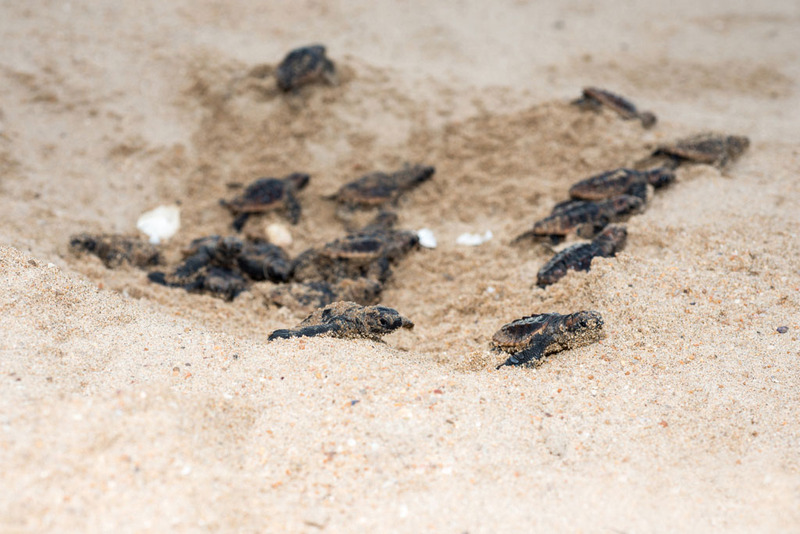 While camping at Cape Hillsborough National Park, we are lucky to see not only a Loggerhead Turtle but also baby turtles hatching from their nest. Baby Turtles hatch and leave the nest. 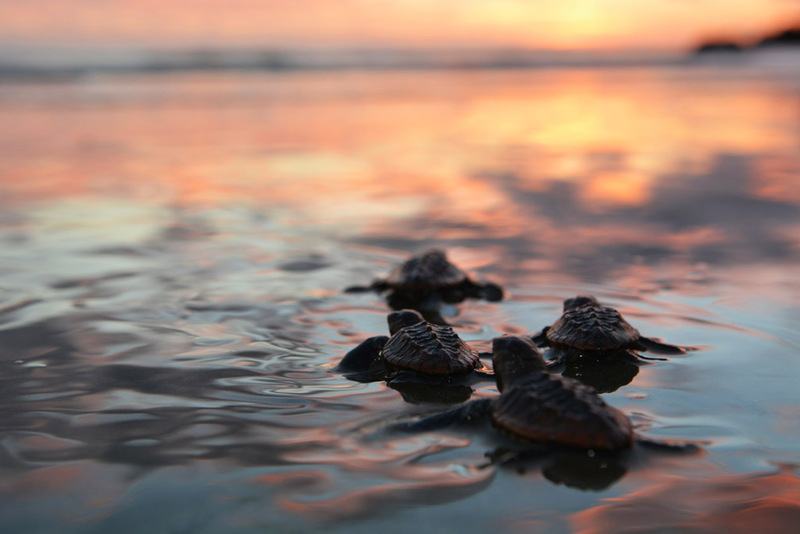 To see these turtles struggle up the beach and later watch their cute babies with their tiny flippers waving in the air, scurrying down the beach for their first journey across the ocean is a rare experience. With only instinct and the moon to guide them, most females will return three times on average during the season, each laying 50-100 eggs. In about 56 days, the babies crack through their delicate shells and in a team effort dig to the surface. This can take a couple of days. They emerge from their nest and together they race to the sea. The odds are against the newborns. They need to avoid the deadly encounter of crabs, goannas, wild dogs and seabirds before they even enter the ocean. Only about 1 in 1000 survives the first year. As few as 1 in 10000 survive to adulthood and return in 30 years’ time and lay their eggs and continue the cycle of this miracle of life. 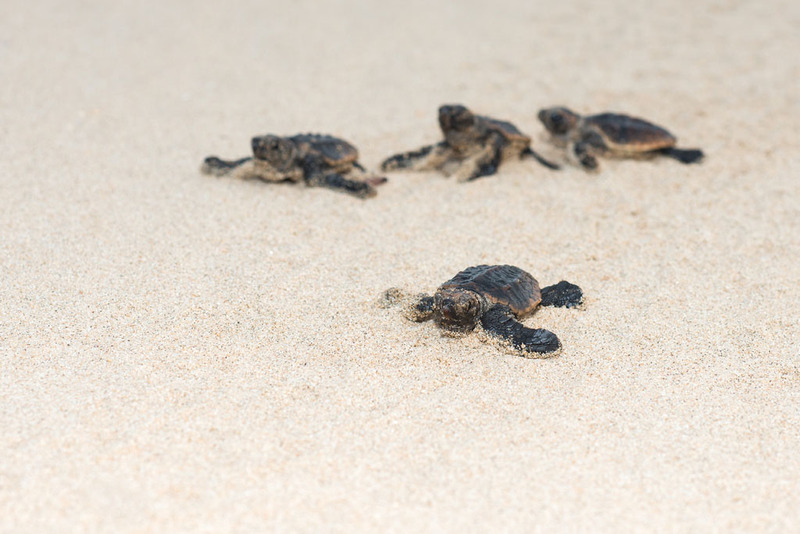 Turtle nesting season here is November to January, with hatchlings emerging until April. They are guided by the moon, and can become confused and disorientated by artificial light. Do not shine torches on turtles leaving the sea, or moving up the beach. 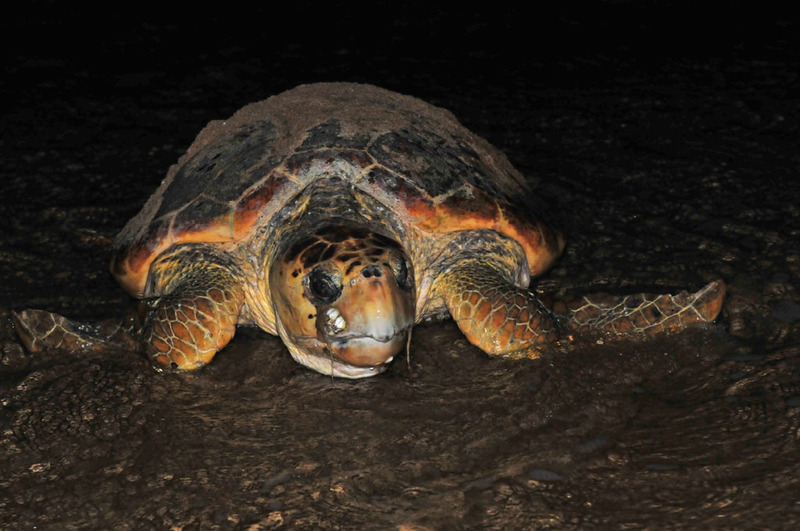 The best time and chance to see turtles is full moon, high tide and between sunset and sunrise. She is guided only by the moon as she heads back to the ocean after laying her eggs. 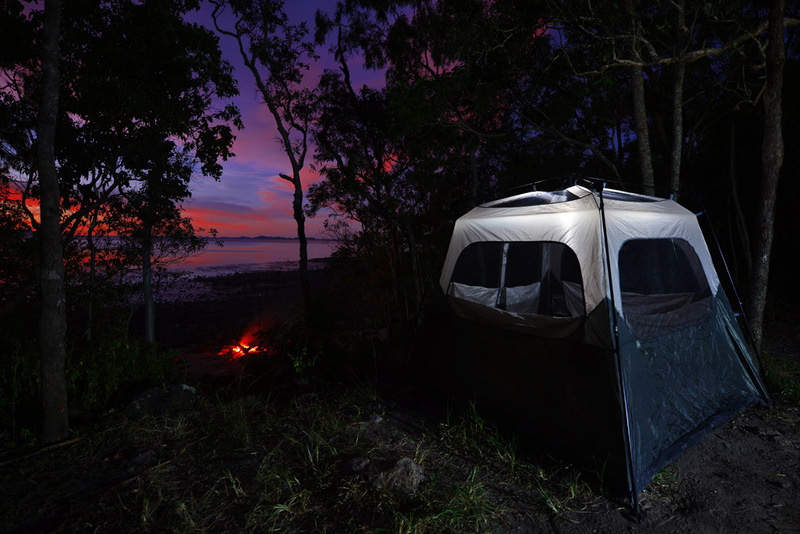 We camp at Smalleys Beach in Cape Hillsborough National Park which is about 5 km from the Cape Hillsborough Beach which is famous for the kangaroos at sunrise. Smalleys Beach camp is a bush setting on the edge of the ocean and some sites have great views. The shaded camp has picnic tables at each site, drinking water and flushing eco-toilets. Sea turtles are among the most endangered animals on the planet. Populations are declining worldwide. They face many threats, most of them from humans. It is no wonder the odds are against them. Fishing activities, boat strikes, illegal sea turtle shell trade, predators, beach erosion, marine pollution and climate change to name a few. Even though turtle conservation has progressed and people are more aware and dedicated to the conservation of the environment; there is still a long way to go. 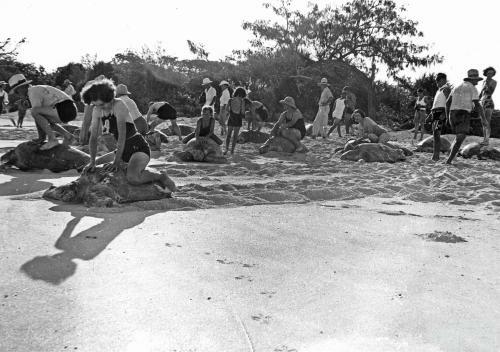 Tourists ride turtles at Heron Island, 1938. A tough little survivor from birth that faces a lifelong journey full of danger now faces extinction. Thank you for writing such a great blog! I love your photos and all the information about the turtles. Great work…. Keep it up!! Thank you for visiting, reading our blog & commenting Sam. Great stuff Ray & Sue. You are always rewarded for your love of wildlife. We are sure they know this. What are the odds of seeing them here? Hi Steve and Louis thanks for your comments. No it is not often the turtles are seen here, so we were very fortunate. They are seen though, on both Smalleys Beach & Cape Hillsborough Beach once in a while so you can get lucky! Wow! Love the blog & the new website is just gorgeous Ray & Sue. Would love to meet you both one day. You are an inspiration with your photography & love of wildlife & conservation. Thank you Laila for your consistent and lovely comments. Maybe one day our paths will cross in this big country of ours. Wow great work again guys. Incredible photography and love the new design of the website. Though it’s a great blog I am not sure what you mean by the kangaroos are only just up the road. Do you mean the kangaroos at the resort? Don’t you have to be staying at the resort to see them? 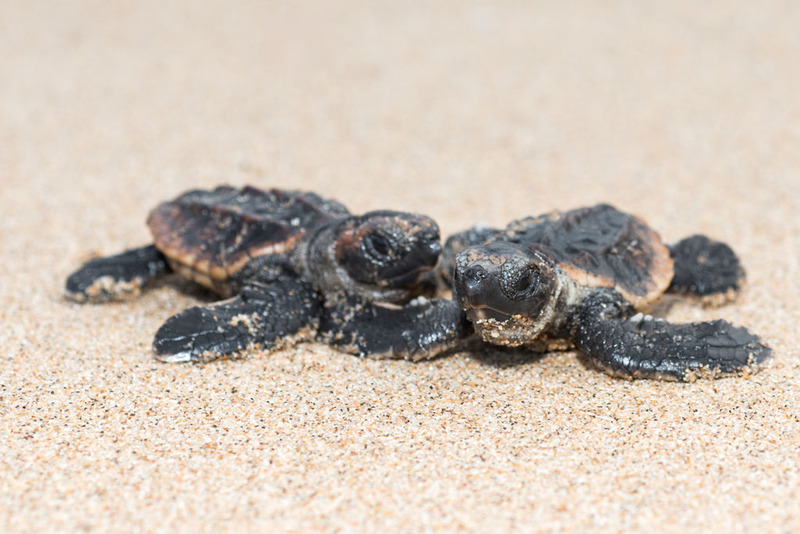 As it would be very rare to see the turtles do you think Cape Hillsborough is really worth the detour while doing a road trip or Australian trip? Thanks Justin. Cape Hillsborough is a large national park with two main accessible beaches – Smalleys beach & Cape Hillsborough Beach. There’s about 5 kms driving distance between them. The resort and kangaroos are at Cape Hillsborough Beach. No you don’t have to stay at the resort to see the kangaroos on the beach at sunrise. All you need to do is be there a little before sunrise & park outside the resort and walk down to the beach. However the resort is a nice place to stay; during the day the kangaroos lounge outside the accommodation so you have more opportunities to see them. The resort also does look after the wildlife & the kangaroos wouldn’t be there without them. And yes it is worth the detour because to see the kangaroos on the beach at sunrise is beautiful and pretty much guaranteed. Awesome! Awesome! Awesome! Blog & new website. Once again you have captured another icon in your own unique way. Love the blog & the bit of history. When you see images like that it is a wonder we have any wildlife left. That camp site looks like the ultimate spot! I do want to a ask similar to what Justin asked above, would your recommend a stop at cape hillsborough for just one night? Is there a good chance to see the kangaroos on the beach? Also eungella would you recommend one night stop there? We were thinking of one night in both places but not sure if thats practical. Thanks for your comments Shelby. The camping spot is in an ultimate & beautiful bush setting. Yes we would recommend Cape Hillsborough for one night, as you will see the kangaroos for sure, it is really beautiful & only about half an hour drive off the highway.To see the platypus in Eungella we think a minimum of two nights. The drive from Mackay is over an hour & the platypus can be very elusive. Two nights will give you a very good chance of spotting them. Fantastic, how something so small manages to survive at all in the sea without the threat of humans is amazing. Love your work thank you. Thank you Noela. They are certainly one of the miracles of life! Absolutely stunning!! Love the new website! Inspirational. Firstly let me tell you how gobsmacked I am by your high quality & stunning work. Shelby was telling about this site for some time & I have only got around to having a look. I could spend hours on this website! Its almost like a small nat geo. What a unique experience to not only see these turtles but have them all to yourself. Keep up this blog, I for one will be a regular reader. Hi Sue. We are glad you finally made it to our blog! To see the turtles was a great experience. We still now pinch ourselves to make sure it really happened! Thanks for your comments, they made our day.